This shop featuring our tutorial on how to make a simple mini-cupcake long-stem flower bouquet has been compensated by Collective Bias, Inc. and its advertiser. All opinions are mine alone. Birthday's are a big thing around here. Another year is a gift and an accomplishment that should definitely be celebrated! At my own admission though, I have a tendency to over-do, which can detract from the occasion all-together. Over the past year or so, I've adopted a new approach to celebrating birthdays. I've applied it across the board for ourselves, our children, and extended friends & family. It's a pretty simple concept: "something sweet & a small treat." Most of the time that means a meaningful card, cupcakes, and a gift card or a small gift. 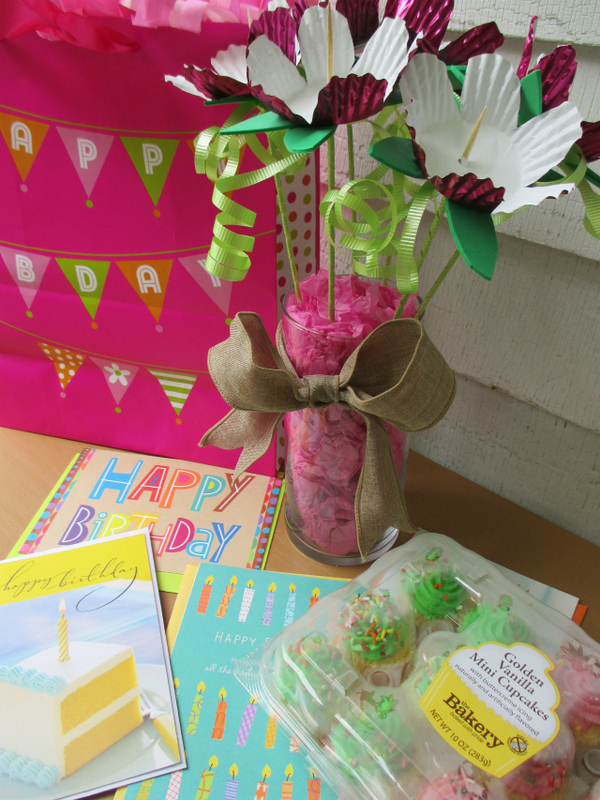 Though I've stepped back from the stressful process over-doing birthday's, I still love to find creative and special ways to present small birthday gifts and treats! This simple mini-cupcake long-stem flower bouquet is my new go-to for gifting sweet treats to friends & family. Check out the simple supply list and my tutorial below. I wanted to make something cute for my sister in-law's birthday so, I decided to make her a simple mini-cupcake long-stem flower bouquet. I started by picking up all of the supplies. I am generally a one-stop-shop kinda' gal. With 3 kids, it's easier on us all if I don't have to stop at several stores; I love that I can grab everything that I need in one-stop at Walmart! 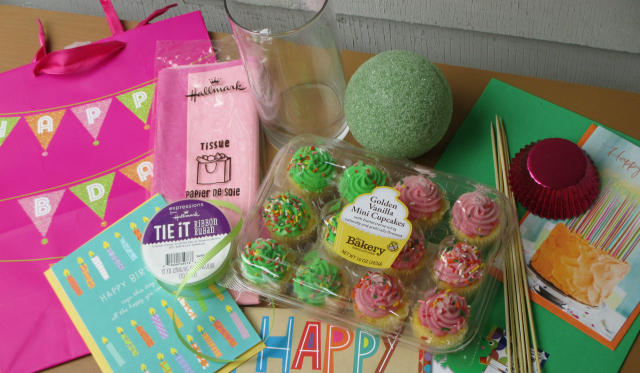 I picked up an adorable glittery Hallmark gift bag for $2.97, lime green Hallmark ribbon for .97 cents, Hallmark tissue paper for $1.47, several Hallmark birthday cards for .47 cents each, mini-cupcakes from the bakery section $2.98, and all of my other supplies to put together my mini-cupcake long-stem flower arrangement. To make your long-stem flower "stems," start with 1 bamboo skewer and 1 10" piece of lime green ribbon. Affix a small 1/4" piece of double-sided tape onto your skewer. Wrap one end of your ribbon around the double-sided piece of tape to affix ribbon to the bottom of the skewer. Continue by twisting/wrapping your ribbon all the way around/up your bamboo skewer leaving 3" of unwrapped bamboo on the top/tip of your skewer. Affix the end of the ribbon with a 1/4"piece of double sided tape as you did on the bottom of your skewer. Repeat this step for all of your skewers/long-stem flower "stems." Use your green craft foam and scissors to cut a shape that resembles two flower leaves connected (refer to image above). You will need to make/cut 2 for each skewer/long-stem flower. Affix the leaves to your skewer by poking the skewer through the underside of each leaf foam form in the center section, as referenced in the image above. Repeat this step for all of your skewers/long-stem flower "stems." 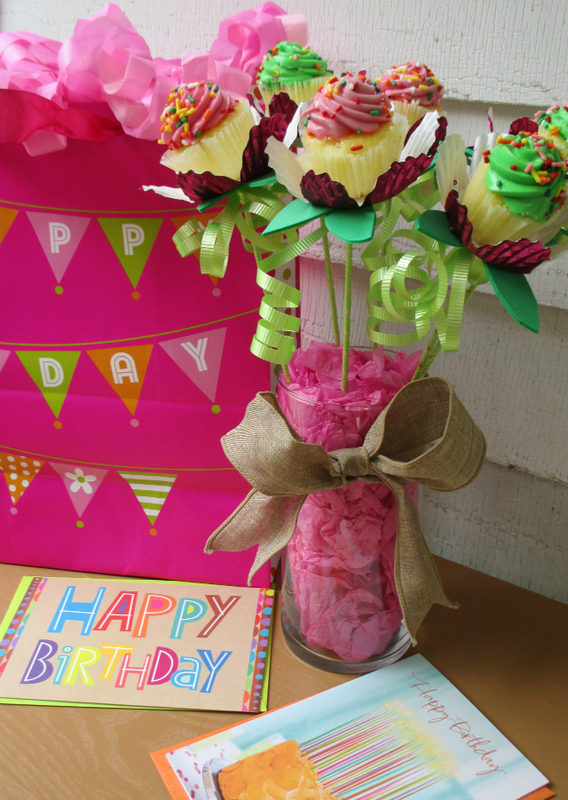 To create your flowers, fold a cupcake liner in half, with the metallic/color side up. Use your scissors to cut/create petals (leaving the center/bottom circle of the liner completely in-tact) as referenced in the image above. Repeat this step for all of your skewers/long-stem flower "stems." Affix to your long-stem flower skewers by poking the skewer through the underside of the center section, as referenced in the image above. Cut 2 x 2" pieces of lime green ribbon for each of your skewers /long-stem flowers. Tie ribbons around the top, just under the two foam leaf forms. Use scissors to curl your ribbons as referenced in the image above. Repeat this step for all of your skewers/long-stem flower "stems." Next, cut your dry floral foam to size (depending on the vase/container you are using) using a knife. Wrap a piece of colored tissue paper around the underside of the foam and up around the sides (leaving the top of the floral foam exposed to arrange/affix the stems of your flowers). 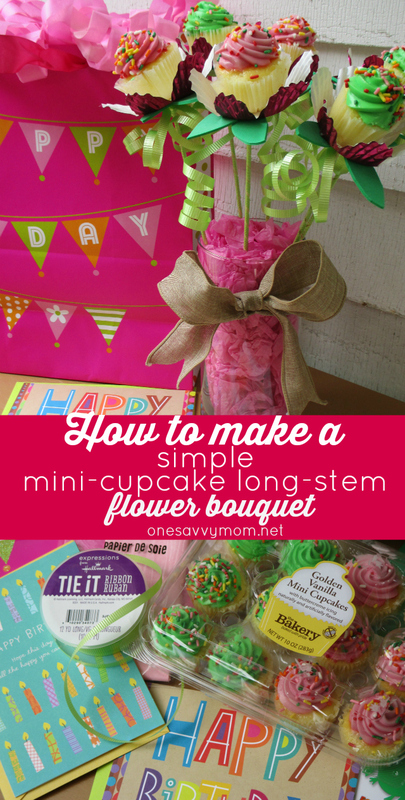 Arrange your skewers / long-stem flowers in your vase (do not affix your cupcakes just yet!) Once arranged, use a small piece of tissue (fluffed) to cover the top of your floral foam. The fluffed tissue paper should meet the brim of the vase as referenced in the image above. Last, affix your mini-cupcakes to the ends of your skewers to complete the center of your mini-cupcake long-stem flowers. 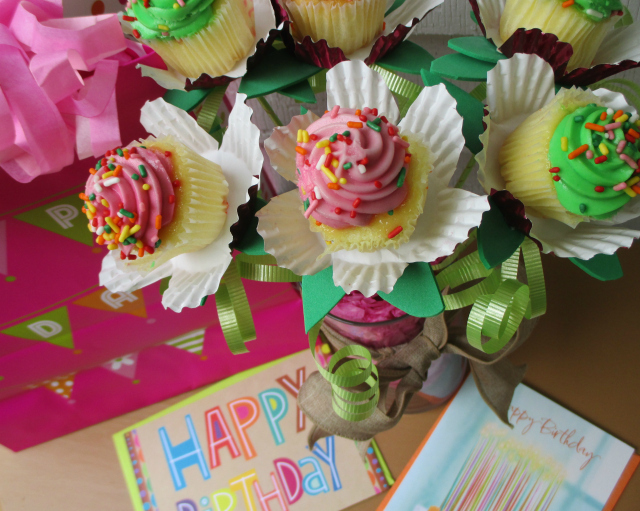 Present your super cute mini-cupcake long-stem flower bouquet and a special Hallmark card to someone special in your life on their birthday; watch their face as they light up with delight! 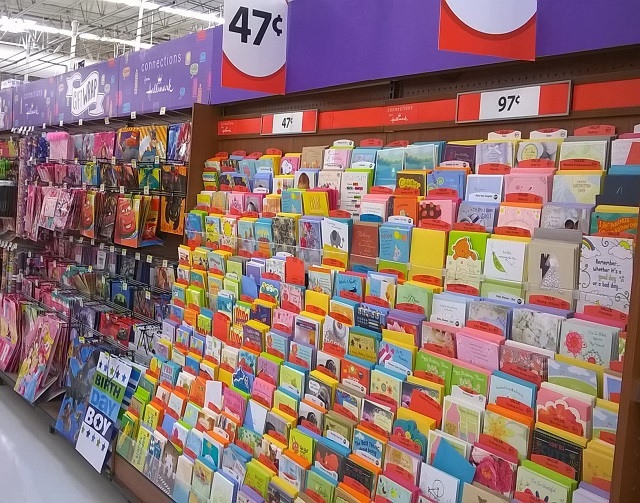 Make sure to stock up on plenty of Hallmark cards when you stop at Walmart. Starting at just 47 cents, this particular "connections from Hallmark" line isn't available anywhere else. It's a more than affordable way to remind all of the people in your life just how special they are to you! 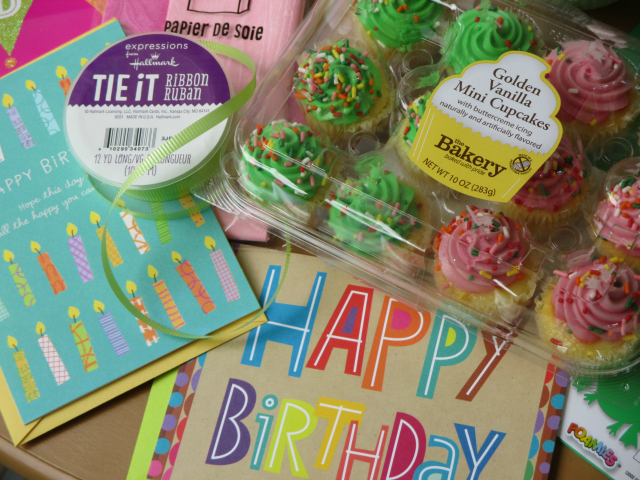 We make birthday's special in our home with fun DIY's and great Hallmark cards starting at just 47 cents at Walmart. 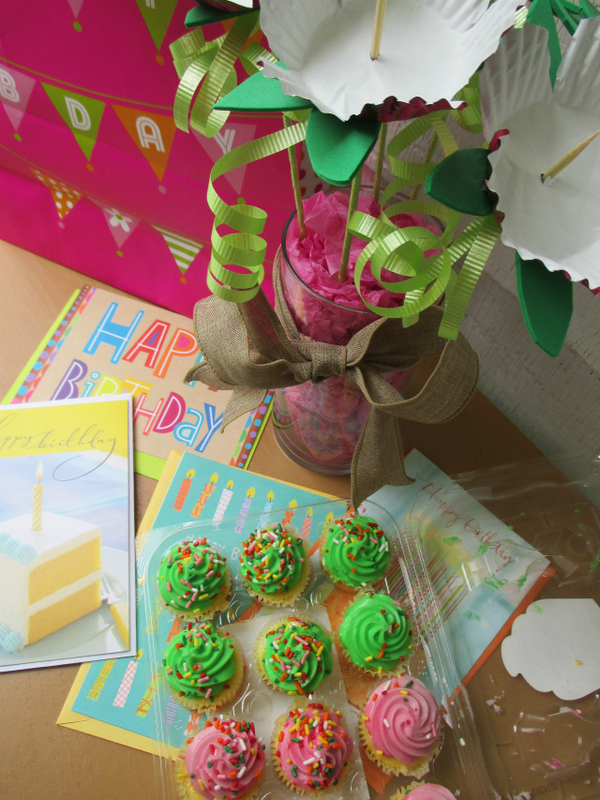 How do you make birthday's special for the people in your life? Share in a comment below! This is such a gorgeous Happy Birthday Bouquet with flowers. I would love to make this for my sister's birthday. She loves cupcakes and mini cupcakes are the best. Thanks for the colorful idea! Thanks! Mini cupcakes are the best, aren't they? :) If you're able to make a bouquet for your sister, I'm sure she'll love! 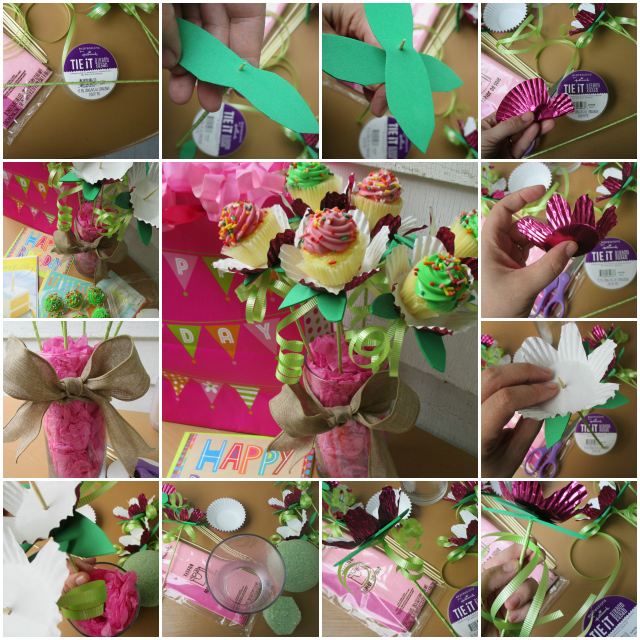 I love how you wrapped the skewers with green ribbon to resemble the stem, and I love that the flower petals use cupcake liners!! This is so cool, beats paying a ton of money for one that is already made. Awesome idea! These are so creative and cute! I will have to make these sometime soon! Thanks! :) they are fun to put together! What a super cute idea! This such a creative way to use cupcakes as a gift. Thanks! :) these little bouquets are fun to put together - and so super simple! These are so cute, I am definitely gonna do this for my daughter's birthday! Thanks for sharing. :) glad you've found it inspiring! they are super fun and simple to make - I hope your daughter has a great birthday! I love these mini cupcake bouquets. I have not seen anything like this before. I would love to try and make them sometime in the near future.